Top Five Records: Is Super Bowl XLVI a Preview of the 2012 Presidential Election? 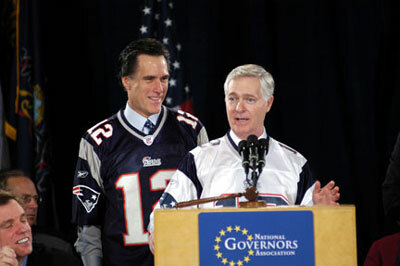 Is Super Bowl XLVI a Preview of the 2012 Presidential Election? A few Sundays ago, I tried to make a joke comparing the New England Patriots, who play in Foxborough, Massachusetts, to the former governor of that state and current presidential hopeful Mitt Romney. The Patriots were playing in the AFC Championship without really beating anybody; to that point, they hadn’t had a victory over a team with a regular season record better than 8-8. Like Mitt Romney, I chided, who currently leads a field of potential candidates who even Republicans will admit is less than stellar, the Patriots were paving their way to victory more on the inadequacies of others than on their own talents. It was supposed to just be a lame joke that unfairly wrote off a team I admittedly don’t like. But the more I thought about it, the more similarities I noticed between the political landscape of the last twelve years and occurrences in the NFL. The fact that this will be the third consecutive time the American people will elect a new president in the same year that they watch the Patriots play in the Super Bowl is intriguing enough … but does it have any significance? I don’t really think so. But at least it gives me an excuse to write about both sports and politics in the same column. Consider this: the New England Patriots drafted Tom Brady and hired Bill Belichick in 2000, the same year George W. Bush was elected president. The following year Bush signed the Patriot Act, Tom Brady became the starting quarterback in the NFL, and the Patriots won the Super Bowl for that 2001 season. The Patriots and Bush would both win together in 2004, both by a narrow margin, the Patriots against the St. Louis Rams, Bush against John Kerry. After winning again in 2005, the next Super Bowl the Patriots would play in would be in 2008. Despite being the dominant team for most of the last decade, the Patriots were upset by the much less experienced New York Giants, aptly nicknamed “Big Blue,” led by newcomer and relatively unseasoned quarterback Eli Manning. Sound familiar? If the Patriots represent an embattled Republican candidate from a mediocre field looking to recapture the throne, there is also quite the uncanny resemblance between the Giants and presidential incumbent Barack Obama, who despite his success in 2008 has not quite been able to deliver on the potential we saw four years ago. However, the Giants and Obama may be surging at the right time, and may be able to capitalize on good timing and an uninspiring opponent to achieve their victory. The Giants are finally healthy and coming off of wins against arguably the two best teams in the NFL, the Packers and the 49ers. In the last year Obama has been able to claim the paramount victory in the war on terror with the death of Osama bin Laden, he’s ended the war in Iraq, and in the last several months unemployment has declined significantly. So what does that mean for tonight? Like I said before, probably nothing, although I have a feeling the odd similarities will continue to play themselves out this year. What do I mean by that? I’ll spare you my political opinion, but let’s just say I have a good feeling about the Giants.